A Cabinet Diary is an absorbing account of the endeavours of a government under extreme pressure. Christmas 1991 found Australia's Labor government, newly led by Paul Keating, at the nadir of its fortunes. In March 1993 it defied all predictions and triumphed in an 'unwinnable' election. This book, the result of a daily diary kept by a senior cabinet minister, tells the story of this ultimately successful struggle to survive. This is the first time a cabinet diary of this nature has been published in Australia. 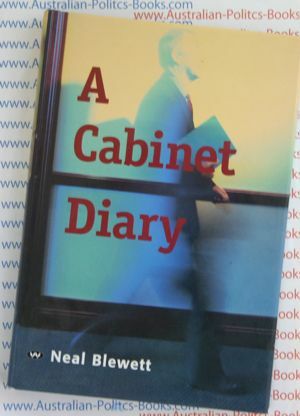 Unlike a memoir compiled in the tranquillity of retirement, Neal Blewett's diary is an immediate and intimate record of the workings of cabinet government at a moment in time. While the book is a justly proud testament to a victory against the odds, there is no attempt to reinterpret events in order to vindicate a career, excuse hasty judgements, or white-wash ill-conceived plans. A Cabinet Diary gives an intriguing view of legendary Labor figures in discussion and debate as they battle to forge policies they can sell to the public and pressure groups against those proposed by a resurgent Opposition. We see Keating, Beazley, Dawkins, Button, Howe, Willis, Richardson and colleagues in parliament, cabinet room, caucus, Canberra restaurants and the media as they thrash out and thrash over issues and principles that are vital in the lives of Australians today. Through Neal Blewett's accounts of dealings with his own department officials, we gain a fascinating insight into relations between ministers and public servants as they respond to public demands, argue among themselves, and attempt to shape government policy. Along the way, A Cabinet Diary also provides snapshots of hectic episodes and quiet interludes in the life of an Australian cabinet minister. Born in Launceston, Tasmania, Blewett was educated at Launceston High School and the University of Tasmania, from which he graduated with a Bachelor of Arts and a Diploma of Education. Blewett received a Rhodes Scholarship and studied PPE at Jesus College, Oxford between 1957 and 1959 for a further BA (later converted to a Master of Arts). He also obtained a D.Phil. in political science. In 1974, he was appointed professor of politics at Flinders University in South Australia, until 1977 when he ran for parliament. When Labor under Bob Hawke won government in the 1983 election, Blewett was made Minister for Health. In 1987, with the introduction of "super-departments", he gained additional responsibilities as Minister for Community Services and Health. As Health Minister, he oversaw many important reforms such as the implementation of the Medicare universal health scheme, the Disability Services Act 1986, a 'Drug Offensive' which included tobacco smoking and alcohol, and in what is considered his greatest legacy, a national strategy to combat HIV/AIDS. The strategy included a major education and advertising campaign (including the famous 'Grim Reaper' advertisements), and anti-discrimination legislation against HIV/AIDS sufferers. In 1990, he became Minister for Trade and Overseas Development. Blewett supported Paul Keating in his successful 1991 leadership challenge against Hawke, and when Keating became Prime Minister, Blewett became Minister for Social Security until he retired from politics in 1994, sparking a Bonython by-election. Neal Blewett has had a varied career as academic, politician and diplomat. He was Tasmanian Rhodes scholar in 1957 and gained a D. Phil at Oxford University for his study of the British political crisis of 1909-1910, later published as The Peers, the Parties and the People. He taught successively at the universities of Oxford and Adelaide and became Professor of Political Theory and Institutions at Flinders University in 1974. An opponent of Australian participation in the Vietnam War and an active civil libertarian, Neal Blewett entered Federal Parliament as ALP member for the South Australian seat of Bonython in 1977. As Health Minister in the Hawke governments he was responsible for the introduction of both Medicare and Australia's much praised AIDS program. He later served as Minister for Trade and Overseas Development. During the first Keating government — the period covered by this diary — he was Minister for Social Security. Neal Blewett became Australian High Commissioner in London in 1994, his political experience and wide cultural interests serving him well during his four years in that post. He was on the Executive board of the World Health Organisation from 1995 to 1998 and in 1998 served as a member of the transition team for Gro Harlem Bruntland, DirectorGeneral-elect of WHO. In 1997 he was made a Companion of the Order of Australia.